It is a very necessary message...Please read it with attention.. "The Mastermind Jinda Sukha" Will be released on 11 September 2015. We are feeling Sorry from all page members that we are again extending the date of our Movie.As u all know that these type of movies faced many difficulties like Censor , Distribution and lack of screens ..we are also facing these problems thats why "The Mastermind Jinda Sukha" is being released on 11 Sep 2015..This is a final date and it will not be extended ..We hope that You all will support us as before..It is also a big struggle to show you these reality based movies.. We all are very much thankful to you for your support ..
Singh Brothers Australia present “The Mastermind - Jinda Sukha” . this movie is a based on a true story of bhai harjinder singh Sukha and Bhai Sukhdev singh sukha. Movie releasing worldwide on 11 Sept 2015. 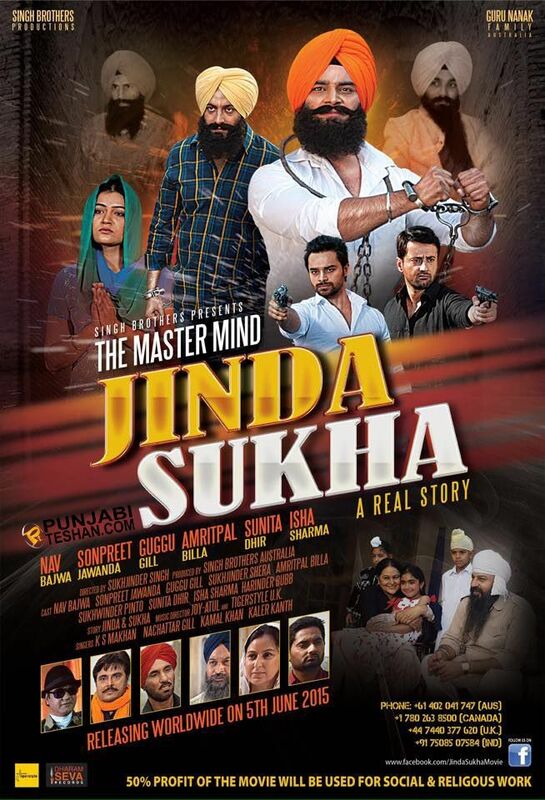 Punjabi film 'The Mastermind Jinda Sukha', which was set to be released on September 11, has been banned in India. The film, which is based on lives of the assassins of former Army General Arun Kumar Vaidya, was previously granted clearance from the Censor Board on July 24, but has now been banned after the union home ministry and intelligence bureau (IB) raised objections. While speaking to HT, director of the movie, Sukhjinder Singh, said, "The advisory committee of the Censor Board called us on Tuesday for a meeting in Mumbai. They told us they had received a letter from the home ministry and IB raising objections to the release of the film. They felt the movie would hurt the religious sentiments of people leading to riot like situations. As a precautionary measure the board decided to ban our film," added the director. The director made offers of cutting scenes there were objections against. "Although we offered to cut scenes which they had objections with but on Wednesday they denied this as well. There has been no objection raised by the board in releasing the film overseas - so we would be releasing it abroad on the scheduled date," he asserts. Talking about the controversial content, " If the film had controversial content the censor board would have never given it a clearance on the first go, in fact, the film would have taken the audience back to the 1980's when Harjinder Singh Jinda and Sukhdev Singh Sukha got capital punishment for assassinating the former Army General Arun Kumar Vaidya. The film was based on true facts and letters exchanged by both during imprisonment"
The makers feel that the last minute announcement has come as a surprise which would lead to huge losses for them as crores were invested in the making and promotion of the film.